Protecting and ensuring the recoverability of data across today’s diverse and distributed enterprises can be complex and costly, and often involves deploying numerous nonintegrated point solutions from several vendors to meet the wide range of application service levels. Examples of these point solutions include different backup products for different operating systems and virtual machines, snapshots, continuous data protection, replication and archiving. However, this proliferation of data protection and recovery solutions can introduce its own risks to the organization as the procurement, licensing and ongoing management of all these different systems becomes increasingly complex and disjointed. Taking a more comprehensive, unified approach to managing data—recovering any data, anywhere in the organization, from laptop to mainframe, from a single console—can not only reduce your capital and operating costs, but can also provide enhanced application availability, leading to improved IT service levels. The IBM® Tivoli® Storage Manager family of products has long been recognized as a leader in unified recovery management, providing the ability to protect a wide range of systems including virtual machines, file servers, email, databases, mainframes and even desktops from a single administration interface. 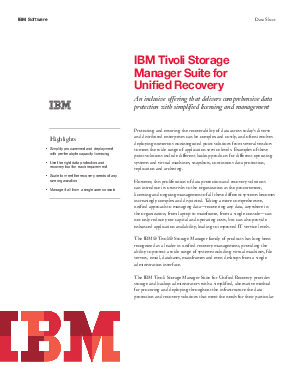 The IBM Tivoli Storage Manager Suite for Unified Recovery provides storage and backup administrators with a simplified, alternative method for procuring and deploying throughout the infrastructure the data protection and recovery solutions that meet the needs for their particular environment.